Square Foot Gardening is a gardening concept of using great nutrient-rich soil and growing as many vegetables as possible in a small space, usually either 3 or 4 feet across. The Square Foot Gardening method is one of the simplest and easiest ways to either learn to garden or to maximize your gardening space. Not everyone is blessed with a large backyard vegetable garden and sometimes all that is available is our patio. With square foot gardening you can grow a ton of vegetables or herbs in a small space year round. 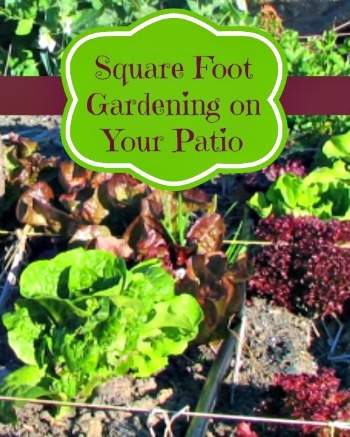 Did you know that you can even do square foot gardening on your patio? You can! First decide how much area you have for your grid, either 2, 3, or 4 feet across with 4 feet being the most common. You have to build out the size square that is going to fit onto your patio using 6-inchwide untreated lumbar. If your patio is cement, you might want to build a bottom to your box. If the bottom is the ground, don’t forget to put down a weed barrier. The soil used in square foot gardening has to be jam packed full of nutrients and a blend of different materials like potting soil, compost, vermiculite, peat moss, earthworm castings, plus blood and bone meal is needed. Make sure to water down this potting soil mixture until you can squeeze a handful and no water drips out which shows you that the water has been completely absorbed. Add the moist soil to the planter box then place a 12” grid on top so you know where to place your plants. Seed packets have good guidelines as to know how many seeds to put into a space. If you are growing tomatoes which are heavy nutrient eaters, one plant per square works best. This same rule of thumb goes for pepper and squash plants. Smaller root plants like carrots and radishes can easily have 16 seeds per square, sometimes more depending on the varieties chosen. Very little weeding occurs when using the square foot gardening method but if one does pop up, remove the entire root system. Try different plants and herbs in your square foot garden (but be careful not to plant certain plants too close to each other) and most importantly, plant what you like to eat! With this gardening method, you will grow more vegetables than you were anticipating! Once a square has finished, clean it out and add fresh soil and a new set of seeds – depending on your zone, you can grow year round with square foot gardening.